The question arose if a kill boundary could be used as a wall, and if it could be removed during game play. From my answer I thought this was a very good question to explore while discussing how Safe Boundaries and Kill Boundaries are used in forging Reach. When a forger places a Safe Boundary onto a map, they are defining the boundaries of the playable area on the canvas. They are restricting the playable area to the volume that the Safe Boundary occupies. 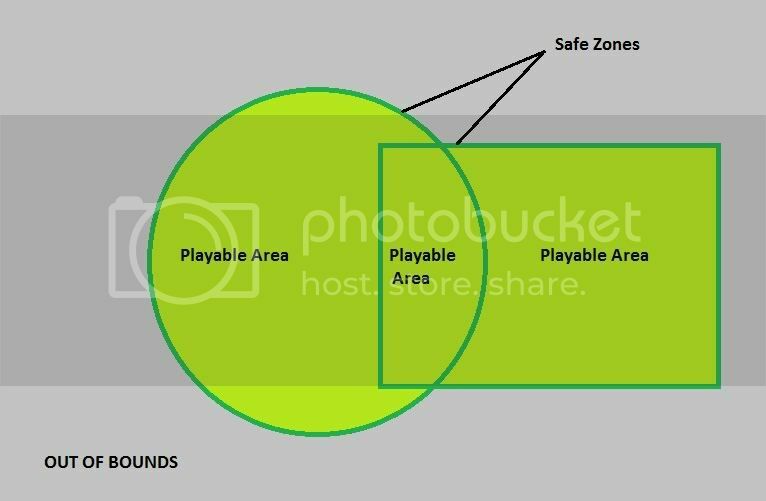 Multiple Safe Boundaries define the playable area(s), whether they are contiguous or not. It does not matter if only one Safe Boundary is placed on the canvas, or multiple Safe Boundaries are placed on the canvas. If a Safe Boundary exists on the canvas, then anywhere outside of a Safe Boundary is outside the playable area. The default behavior (e.g., when no Safe Boundary is used) for any canvas is to make the entire canvas the playable area. The Safe Boundary is invisible during play, but its affects are very real to the player. There are two types of Safe Boundary - the Soft Safe Boundary and the Safe Boundary (which we will refer to as Hard Safe Boundary for the rest of this article). They both define the area that is playable, but they convey that information to the player in different ways. When a player leaves a Soft Safe Boundary, they get a warning that they must return to the battle area (the playable area of the map). This warning continues for 10 second. At the end of that time, the player dies. When a player leaves a Hard Safe Boundary, they die immediately. Since the warning or immediate death occurs when leaving the Safe Boundary, if a canvas has both a Soft Safe Boundary and a Hard Safe Boundary, then they are all treated as Hard Safe Boundaries. That is, if leaving one Safe Boundary causes immediate death, then leaving any Safe Boundary will do the same. It is not clear if this was by design (to maintain consistency in leaving the playable area) or a side effect. Kill Boundaries come in two flavors also, again a Soft Kill Boundary and a Kill Boundary (which we will refer to as Hard Kill Boundary for the rest of this article). However, their effects are noticed when a player enters the Kill Boundary. As their names imply, entering a Soft Kill Boundary provides a 10 second warning that the player has exited the playable area; entering a Hard Kill Boundary is instant death. 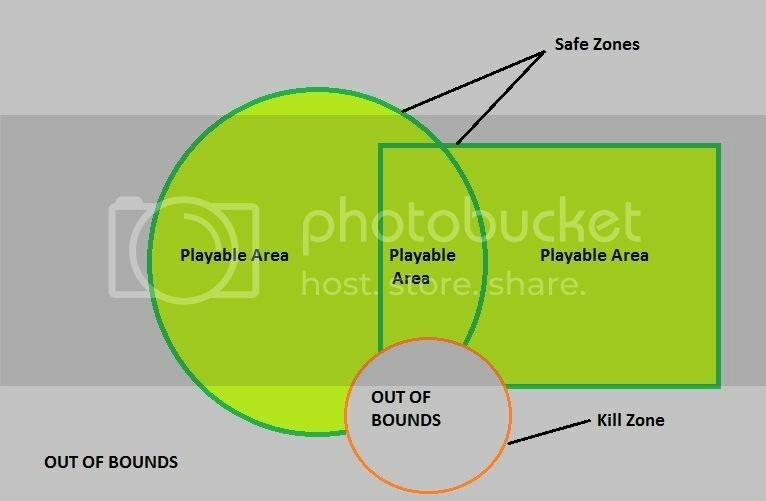 The main purpose of a Kill Boundary is to define areas that are not playable; areas that are out of bounds during game play. The main purpose of the Soft Kill Boundary is to warn the player that they have left the playable area and must return immediately. This is akin to the Guardian on Halo 3 maps, when you step outside the central area of the map. The main purpose of a Hard Kill Boundary is to speed up the death of a player that has ventured out of the playable area so far that they cannot return and will certainly die. After all, who wants to wait 10 seconds at the bottom of a cliff, alive, but not able to rejoin the game in progress? Soft Kill Boundaries do not turn into Hard Kill Boundaries when a Hard Kill Boundary is also present on a map. Having both types can be useful on many maps. Finally, where Safe Boundaries and Kill Boundaries overlap, the Kill Boundary overrides the Safe Boundary. Without any Safe Boundaries on the canvas, Kill Boundaries define the areas not in the playable area of the map, though the entire canvas is otherwise the playable area. Soft Kill Boundaries are used quite frequently to make specific areas off limits within a Safe Boundary. For example, a forger may wish to keep players from camping on roofs or pillars. A Soft Kill Boundary on top of a roof gently notifies the player that they should get back down to the playable area. Safe Boundaries and Kill Boundaries cannot be spawned during game play, but they can be gated out of the map during Invasion game phase changes. Since Kill Boundaries overlapping Safe Boundaries override the Safe Boundaries, one can emulate the spawning of a Safe Boundary by overlapping it with a Kill Boundary, then gating the Kill Boundary during a phase change. When the Kill Boundary disappears, the Safe Boundary will appear to have spawned. Really, its effects will begin to appear for the players to experience. In an Invasion game, emulating the spawning of a Safe Boundary essentially grows the playable area as the round progresses. Likewise, gating Safe Boundaries shrinks the playable area as the round progresses. Using both in a single phase change can effectively shift or move the playable area across the canvas. But care must be taken, as players may still be in a playable area when it becomes out of bounds. This will almost certainly be unintuitive to the player and a point of frustration (a very bad thing for any forge work). Remember, anywhere outside a Safe Boundary is the same as being in a Kill Boundary, if and only if a Safe Boundary exists else where on the canvas? Well, by gating one Safe Boundary off the canvas while a second Safe Boundary remains else where, the space occupied by the first Safe Boundary is now out of bounds. It will appear to those players in the Safe Boundary that a Kill Boundary suddenly appeared over them. The type of Kill Boundary experience will be dependent upon the type of Safe Boundaries used. If one of them is a Hard Safe Boundary, then the experience will be that players will suddenly die. If they are all Soft Safe Boundaries, then the experience will be that the players will linger for 10 seconds to their death if they cannot get to another Safe Boundary quickly. A Kill Boundary could be used as an invisible wall. But it should never be used in this capacity for several reasons. First, it is not a wall, but an engine influence zone. Trying to make a wall out of a non wall is often plagued with problems for the game experience. Additionally, it is invisible. Can you imagine the frustration a person would have if they did not see a wall, but instantly died from walking into it? One of the key rules to any good forged work is that the map must never be frustrating or confusing. Also, if you use a Soft Kill Boundary as a wall, your players won't experience a wall, but will experience an out of bounds message on their screen. Again, the experience that your players receive is not the experience of a wall. Setting up respawn points (or zones for Invasion) within a Soft Kill Boundary can have the effect of motivating the players to move quickly to the playable area. But the problem with this approach is simply that it is generally unintuitive that someone would even spawn outside the playable area. It is my observation that this type of spawning technique is not well received by most players. Some players have a natural desire to explore. This technique eliminates any opportunity for a player to explore the area they spawn in, for weapons, vehicles, or other features built into the map.